Things are a little foggy, but I remember Oliver from North Woods Ranch asking me if I had played around with cooking pig's feet. I began to answer, but then his wife, Jodi, blindsided me when she unearthed a monstrous hog's trotter from the deep freeze. This foot was the size of stout oak log, one you'd expect to burn long and hot on the fire. Star struck, I had to have it. Oliver and Jodi raise heritage-breed Berkshire hogs on pastures just down the road from Carla's childhood home. I've seen these pigs and know their size, but seeing this foot was still a shock. I've cooked pig's feet before; small, pink, well-scrubbed little things that look like the mincing feet of a small dog. Those feet are handy for adding gelatin to stock or thickening up a terrine of head cheese, but there's not much in the way of eating. 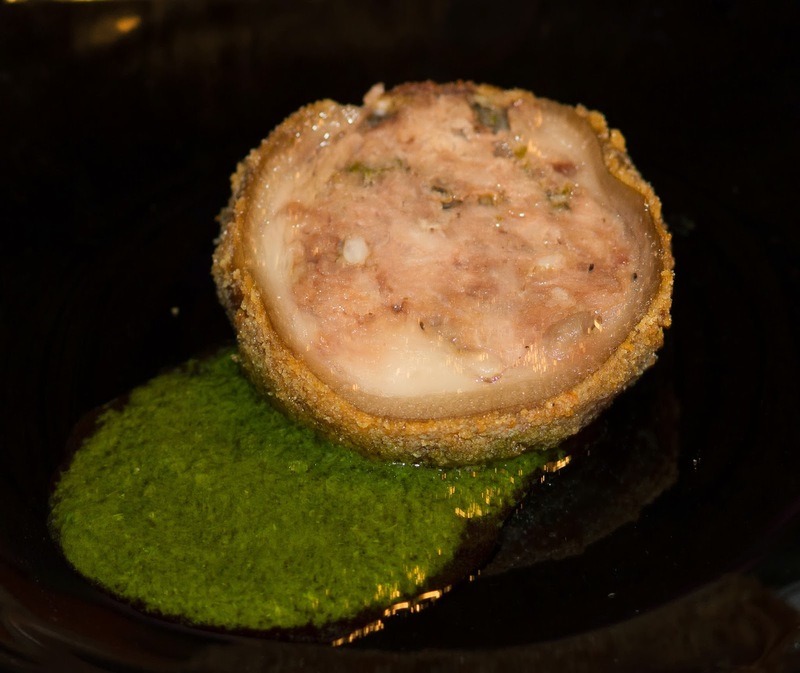 This Berkshire trotter was something entirely different; it was a heavy, powerful limb, something that demanded pride of place as the centerpiece to a meal. 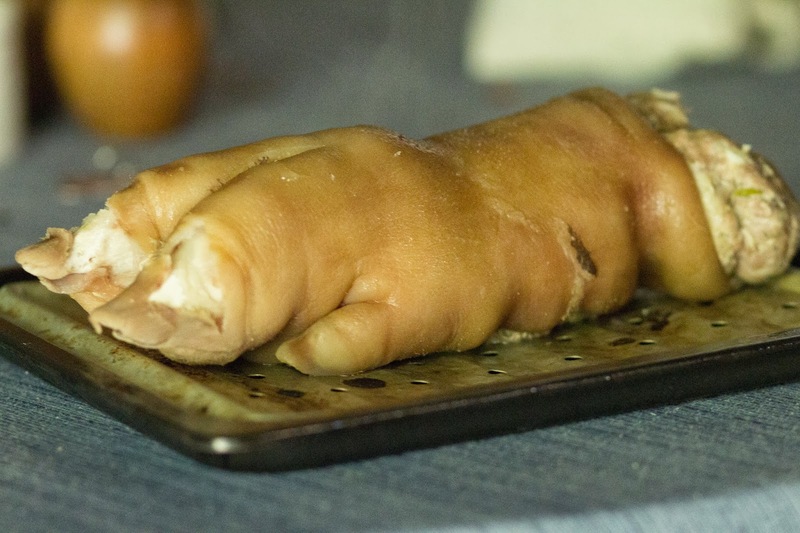 For a monstrous, over-the-top animal part, I went to a recipe for a chef who's known for over-the-top, especially when it comes to pig's feet. 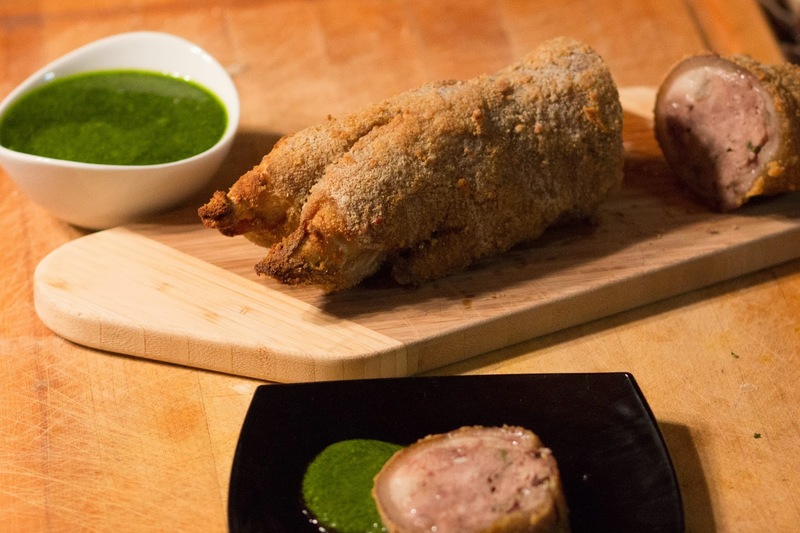 Martin Picard runs Au Pied de Cochon ("The Pig's Foot") in Montreal. Their signature item is a foie gras stuffed pig's foot, and it was this recipe that I used as a base-line for dealing with this hunk of hog. I decided to stuff it with minced pork, garlic, and rosemary, rather than foie gras, as the foot put me in the mood for something rustic rather than elegant. But before I could get to the stuffing, I needed to deal with getting the bones out of the foot. Many offal-centric cookbooks equate boning out a pig's foot as rolling off a woman's stocking. My guess is that they're trying to make something rather surgical and (for some) grisly, into something light and fun. I, for one, think my wife might not be too thrilled if I approached her with a knife and bone saw, muttering "let's get you out of those tight shoes...."
Anyway, getting the bone out wasn't too much trouble. Just take a skinny, flexible knife and slide it between the skin/fat and the bone. I just kept the blade scraping against the bone, to avoid it slipping and puncturing the skin. But this was a big, adult hog, and its skin was very thick and pretty much puncture-proof in its raw state. After working my way down to where the shank begins to lead into the various small bones of the feet and toes, I used a bone saw to cut off the shank, leaving the toes with their bones, and an empty tube-sock of sink and fat flapping open at the other end. Honestly that was the hardest part of this entire dish. Next I rubbed salt and pepper inside the foot and stuffed it with ground pork, garlic, and rosemary. I tucked a flap of skin up to cover the stuffing at the end, then wrapped the entire trotter in a tight binding of cheese cloth. I placed it on a raised trivet so the stock could circulate around and under the foot, and then covered the entire bundle in vegetable stock. This poached for about 6-7 hours until I could easily pierce the skin with the knife. Hot out of the broth, the foot was soft and the skin was easily torn. So I placed it on a drying rack and refrigerated it for a few hours, until the foot firmed up a bit and was easier to handle. To give it a crispy covering, I bathed the foot in a 50/50 wash of dijon mustard and beaten egg, then rolled it in seasoned bread crumbs. The breaded foot then rested another hour in the fridge for the breading to seal and adhere. When it was time to serve, I placed the breaded foot in a 400 F oven for about 25 minutes. Once the breadcrumbs were browned and the skin of the foot was sizzling a bit, I laid a few strips of butter across the top to help crisp up the crust even more. Another 10 minutes and it was time to serve. The richness of the sausage-stuffed foot required something bright and slightly acidic to cut through the fat and skin, so I made a simple salsa verde of parsley, cilantro, garlic, olive oil, and lemon juice as an accompaniment. While this dish was a bit of work, I'm totally thrilled with it. It's rich, flavorful, and knocks the presentation factor out of the park. The skin still has some chew to it, but I don't think you'll ever completely get away from that. Plus, I don't mind - it gives it a nice, gelatinous texture to offset the crispy crust.